I love love love this movie: I laughed, I cried, I got made fun of for crying, and I cried again after the fact when I was explaining how much I liked it. 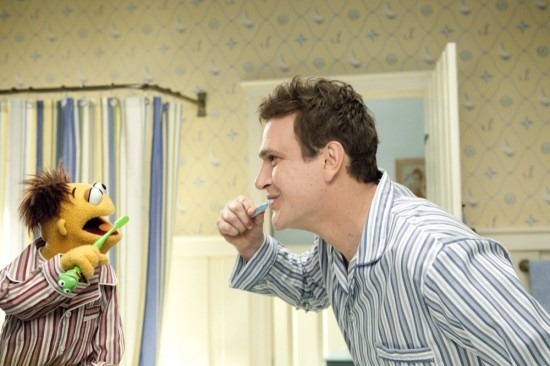 Speaking of which, I heard Jason Segel cried the first time he met Kermit the Frog. That’s my kind of guy. IIn other crush news: I’m also mildly obsessed with apple crisp lately, which goes hand in hand with my absolute disinterest in eating raw apples as of late. So after noticing 600 apples in my fridge that were en route to rotten town, I thought apple crisp was the only solution. Naturally I googled “healthy apple crisp” and within 0.5 seconds of searching I was bored and certain I was wasting my time….off to the kitchen I went, determined to make it on my own. While I’m sure it’s not the healthiest dessert, I do think it is slightly “health-ified” from traditional crisp recipes. 1. Peel and cut apples. Squirt some lemon juice. Pour some agave. And mix to coat. 2. Mix everything else by hand and crumble on top. The “crumble” will be very crumbly. Add more margarine if you want it to be more clumpy. 3. Bake at 375 C for approx 25-35mins. Drool while your home is filled with the most delicious scent. This sounds yummy, Meg! Haven’t seen The Muppets yet, but I hear it’s great! Don’t let anyone give you a hard time about getting emotional at a movie…I do it all the time! I LOVE apple crisp… It is my all-time fav! A healthy version would be perfect since I’m trying hard to eat better because then I could eat it every day and not feel like I should have just skipped a few steps and glued it to my behind lol ❤ keep up the good work! I also think its the change in weather – I just want comfort foods! Seriously! And I don’t want to leave my house! I’ll have to try this crisp…sounds delish!